The Night Circus by Erin Morgenstern (Fantasy): I feel like The Night Circus has been out forever, yet only now has it grabbed my attention. I’ve seen it on store shelves in Target, Barnes & Noble, and other places… But why I didn’t read the blurb or check out reviews of it until a couple months, I have no clue. Plus, Erin is originally from Massachusetts. Yay for MA speculative fiction writers! The Bone Clocks by David Mitchell (Fantasy / Science Fiction): Adding The Bone Clocks to my wishlist was more or less a result of the same for Cloud Atlas (see below). Just as people recommended the latter book to me, the former had just been released, and I figured both might be worth checking out. I haven’t read David Mitchell’s work before, so I’m intrigued by the genre-bending implied in the reviews. Siege and Storm (Grisha Trilogy, Book #2) by Leigh Bardugo (YA Fantasy): Reading this one right now! I loved both Shadow and Bone and Six of Crows, so I knew right away that I’d dive into this book after finishing Naomi Novik’s Uprooted. And with Leigh appearing at the Boston Teen Author Fest in 2 weeks, the timing couldn’t be more perfect. Shadow of Night (All Souls Trilogy, Book #2) by Deborah Harkness (Paranormal Romance): Some readers adore this series. Others don’t, and I can see why. But despite the things that annoyed me about A Discovery of Witches, I still got sucked in (no vampire pun intended) and wound up really enjoying the first installment. Not sure when I’ll get to Shadow of Night, but I’m already looking forward to it. Cloud Atlas by David Mitchell (Science Fiction): Three people have recommended Cloud Atlas to me in the past year. That’s all it took to convince me that I need to read it. 😉 I’ll probably read this before The Bone Clocks, since this one is considered to be Mitchell’s masterpiece. What books did you recently buy or acquire? Have you read or are planning to read of the books discussed above? Feel free to share your opinions and most recent hauls by commenting below. Wow nice haul! 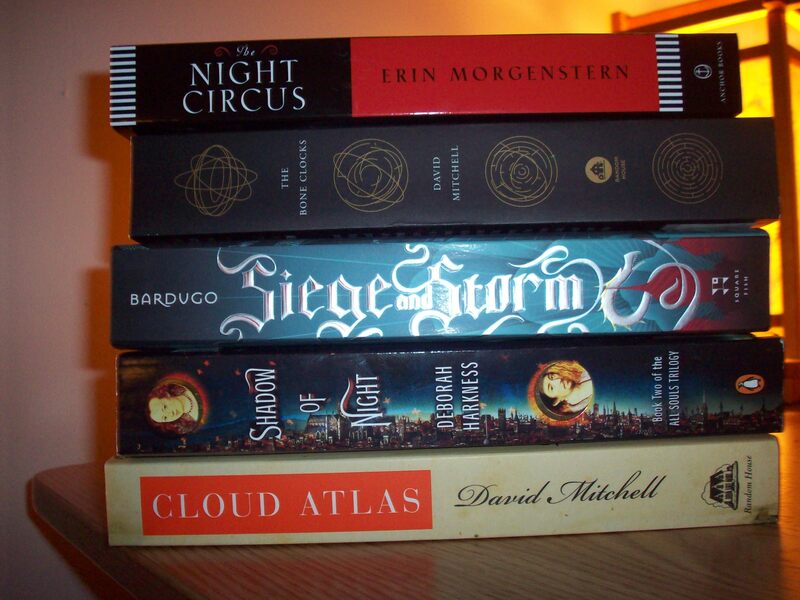 I’ve read The Night Circus, Siege and Storm and Cloud Atlas. I hope you’ll enjoy them! Cloud Atlas was really cool, though I probably didn’t like it as much as I thought I would, especially if it’s considered his masterpiece – I didn’t know that 🙂 I am actually much more curious about The Bone Clocks, it sounds really cool and more my type of story. I’ll be very interested to hear your thoughts! Maybe “his most popular book” would have been a more accurate phrase to use. When anyone has ever mentioned David Mitchell to me, the first book that comes up has always been Cloud Atlas. Nice haul! I have the Grisha Trilogy, but didn’t have a chance to read them. Lots of people seemed to love them, so I had to give it a try. I’ve heard good things about Cloud Atlas, too, though I’m not sure that’s one I’m going to attempt to read this year. Nice haul. The Night Circus is one of my all time favorite books ever. I hope you love all of your new books. Happy belated birthday! Awesome haul! Siege and Storm is the only one I don’t have…yet. Thank you! 😀 What did you think of the other books, if you’ve already read them? I just finished The Night Circus, and I really enjoyed it – like a beautiful dream. I haven’t read Cloud Atlas or The Bone Clocks, but they both intrigue me. Birthday books are the best present (and something people are resigned to giving me). Thanks! So many people who’ve commented on this have said how much they enjoyed The Night Circus. I may have to read it sooner rather than later. Ha ha! Same here. Although certain people (family, not friends) tell me I have enough books and don’t need to ask for more. (*raises an eyebrow*) But I keep putting specific books on birthday and Christmas wishlists nonetheless. Yeah, it was difficult to appropriately “categorize” both of Mitchell’s books. The reviews make both Cloud Atlas and The Bone Clocks sound like they straddle science fiction and fantasy. Plus, the term “genre-bending” popped up quite a bit on Amazon and Goodreads for both books. I really enjoyed The Bone Clocks and The Night Circus is just a wonderfully magical book 🙂 Enjoy! Everyone keeps saying that about The Night Circus. 😀 This makes me even more excited about reading it! Happy belated birthday!! I don’t often venture out of Young Adult (although I really should) but when I do, I read books like these! The Night Circus is one of my all time favorite books, it’s so magical. I’ve heard great things about Bone Clocks, I should read that soon! I really want to read The Night Circus, so many people have liked it.